The reverse of the seal of Maryland. The obverse of the seal of Maryland. The coat of arms of Maryland. To represent the government of the State of Maryland in official contexts and to authenticate certain official documents. The Great Seal of the State of Maryland is the official government emblem of the U.S. state of Maryland. Its official service is to authenticate acts by the General Assembly of Maryland (state legislature), but it is also used for display purposes at most state buildings. Although the state seal has been changed in design several times throughout history, the current model represents the reverse side of the original seal. The seal consists of two sides, a reverse and an obverse. In official contexts, only the reverse side is used. 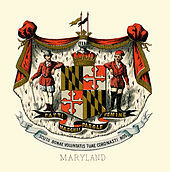 The historical coat of arms of Maryland in 1876. In 1817 and 1854, symbols of the eagle were used along with a version of the original reverse on the 1854 version. The original Calvert seal was brought back into use in 1874, and has had various corrections made to its image and meaning in 1959 and 1969. Maryland has the distinction of having a dual-sided seal, rare among U.S. states and the world. The obverse side of the state seal, which was described by statute in 1959 (Chapter 396, Acts of 1959), shows Lord Baltimore as a knight in full armor mounted on a charger with a drawn sword in hand. The caparisons of the horse on which Lord Baltimore is mounted bear his family coat of arms. The inscription on the rim of the seal shows the phrase, Cecilius Absolutus Dominus Terræ Mariæ et Avaloniæ Baro de Baltimore, which translates to "Cecil, Absolute Lord of Maryland and Avalon, Baron of Baltimore" (Chapter 79, Acts of 1969; Sections 13-101 through 13-105 of the State Government Article of the Annotated Code of Maryland). Quarterly first and fourth, a paly of six Or and Sable, a bend counterchanged; quarterly second and third, quarterly Argent and Gules a cross bottony counterchanged. Above the shield an earl's coronet surmounted by a barred helm affronté Argent. The state motto, Fatti maschii, parole femine (pronounced [ˈfatti ˈmaski paˈrɔle fɛˈmine]), has its origin in the archaic Italian and translates as "Manly deeds, womanly words", or more generally, "Strong deeds, gentle words," which is the translation the Government of Maryland cites officially. [N 1] Maryland is the only state with a motto in Italian. The saying is the motto of the Calvert family (the Barons Baltimore) who first founded the Colony of Maryland. George Calvert, 1st Baron Baltimore, (1579-1632), made it his family's motto in 1622 and it appears that the saying was well known in 17th-century England. The Latin text encircling the seal, Scuto bonæ voluntatis tuæ coronasti nos, is from verse 12 of Psalm 5 from the Vulgate; it translates to "With favor Wilt Thou Compass Us as with a Shield"  The founding date of 1632 completes the circle. Though the reverse side has been the only part of the seal to be cut and is the part of the seal that is primarily used on official government documents, the obverse side can be found displayed around the state, especially on state government buildings, including the Maryland State House. ^ The modern spelling would be "Fatti maschi, parole femmine". ^ State of Maryland (June 17, 2004). "Maryland Seal of 1794". Maryland at a Glance. State of Maryland. Archived from the original on January 4, 2013. Retrieved January 4, 2013. ^ "Article - State Government §13–102" (PDF). Code of Maryland. General Assembly of Maryland. Retrieved September 24, 2014. ^ State of Maryland (2004). "Maryland Kids Page". Maryland Office of the Secretary of State. State of Maryland. Archived from the original on June 29, 2004. Retrieved June 29, 2004. ^ State of Maryland (April 21, 2005). "Great Seal of Maryland (reverse)". Maryland State Archives. Archived from the original on January 4, 2013. Retrieved January 4, 2013. Maryland Archives. 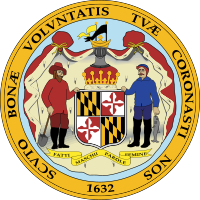 Maryland State Symbols – State Seal. Maryland Secretary of State. The Great Seal of Maryland.